Marshall, S. L. A. (Samuel Lyman Atwood), 1900-1977.
the ring of German forces. (U.S. Army in action series) Reprint. Originally published: Washington, D.C. Infantry journal Press, 1946. States. Army. Airborne Division, 101st-History. A. Joseph. III. Title. IV. Series. D756.5.A7M3 1987 950.54'21 88-600068 Facsimilie Reprint, 1988 CMH Pub 22-2 Center of Military History United States Army Washington, D.C. 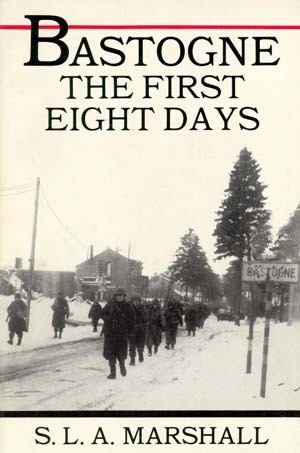 The Center of Military History is pleased to present the second volume in the U.S. Army in Action series, a facsimile reprint of Brigadier General S. L. A. Marshall's Bastogne: The First Eight Days. Originally published in 1946, this brief study provides a combat history of a critical battle during the Allied liberation of Europe in World War II. Outnumbered and surrounded for five days, a U.S. Army combined arms force of airborne infantry, armor, engineers, tank destroyers, and artillery conducted a successful defense of the Belgian crossroads town of Bastogne in late December 1944. They separated the German combined arms formations and destroyed the pieces, halting the offensive. The outcome of this battle was critical to the successful Allied defense against the German Ardennes offensive. Bastogne offers unique insights, capturing the immediate impressions of the soldiers who fought in this harsh winter engagement. The author penetrates the "fog of war" with a coherent narrative that clearly captures the strategy, tactics, and leadership of the battle. This action strangled the German logistical flow to their forward assault divisions, disrupting their offensive tempo and slowing their advance. What emerges is a vivid case study of how decisive leadership and incidents of individual heroism can contribute to overcoming enemy forces and weather. Historians and professional soldiers will find Bastogne a valuable addition to their reading list. The Center of Military History recommends it highly for use in conjunction with Staff Rides. Although later studies provide more depth of research and detailed analysis concerning the Battle of Bastogne, Marshall's book, with its excellent maps, provides a superb one-volume narrative which can be utilized as a guide for officers and noncommissioned officers when visiting the Ardennes battlefield. The Center wishes to thank Mrs. S.L.A. Marshall for her kind assistance with our efforts to reprint Bastogne as well as her continued support of the U.S. Army Historical Programs.